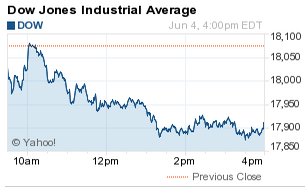 What Did the Dow Jones Industrial Average (DJIA) Do Today? Subject: What Did the Dow Jones Industrial Average (DJIA) Do Today? What Did the DJIA, S&P 500, Nasdaq Do Today? The DJIA today fell more than 170 points after Greece announced plans to bypass a pending debt payment on Friday. Falling commodity prices weighed down the energy and mining sectors. The S&P 500 Volatility Index (VIX), the market's fear gauge, jumped more than 7% on the day. Stock Market News: Today, the markets slipped on falling oil and gold prices, which weighed down energy and mining stocks. Concerns over Greece's pending debt deadline remained mired in uncertainty. Greece delayed its debt payment due tomorrow; meanwhile, German Chancellor Angela Merkel announced that Greece and its international creditors were still far from a possible deal. Fed Focus: The International Monetary Fund urged the Federal Reserve to refrain from raising interest rates until 2016. The global monetary agency said the central bank must continue to keep an eye on economic data and that rates should not increase until there is a clear trend of rising wages and higher inflation. Oil Falls: Oil prices slipped for the second consecutive day as investors brace for an upcoming meeting of the Organization of the Petroleum Exporting Countries (OPEC). WTI crude futures for July slumped more than 2.5% to hit $58.11 per barrel. Meanwhile, Brent oil was down 2.4% to hit $62.24 per barrel. On Tap Friday: This morning, the U.S. government announced weekly jobless claims hit 276,000 last week, besting economist expectations and last week's figure of 282,000. That puts tomorrow's May jobs report in focus. Companies reporting earnings tomorrow morning include LightInTheBox Holding Co. Ltd. (Nasdaq: LITB), Multi-Color Corp. (Nasdaq: LABL), UTStarcom Holdings Corp. (Nasdaq: UTSI), and Yingli Green Energy Holding Company Ltd. (NYSE: YGE). Stocks to Watch No. 2, FIVE: Shares of Five Below Inc. (Nasdaq: FIVE) surged 7.6% on news that the teen retailer boosted its full-year forecast. The firm reported sales rose 22% during the first quarter. Meanwhile, shares of L Brands Inc. (NYSE: LB), the owner of Victoria's Secret, jumped 1.2% after the company reported a same-store sales increase of 5% in May. That's well above consensus expectations of a 2.8% increase. Stocks to Watch No. 3, DISH: Shares of Dish Network Corp. (Nasdaq: DISH) were up more than 4.8% on news the satellite company is in talks to merge with T-Mobile US Inc. (NYSE: TMUS). DISH shares are now at a 52-week high, while T-Mobile was up 2.6% on the day.